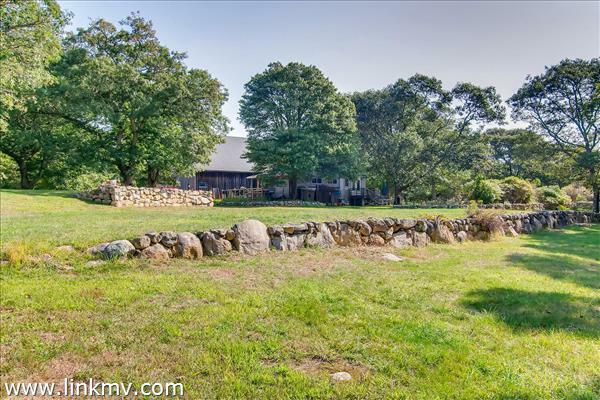 This cozy 2 bedroom, 1.5 bath cottage, and oversized chestnut barn are situated on 4.7 rolling acres in Aquinnah located less than 2.5 miles to Philbin Beach. Previously used as farmland, the landscape features majestic mature trees and is surrounded by handcrafted stonewalls. When you enter the home you are instantly welcomed by the beautiful and unique variety of warm wood tones as well as the gas stove in the center of the open concept kitchen and living room. Beyond the kitchen are the formal dining and family rooms. Upstairs the two bedrooms share a full bath. The spacious three level antique chestnut barn is currently used as an office, workshop and storage but could have many purposes. This is a wonderful opportunity for year round or summer living. Living room, kitchen, dining room, half bath and den. Master bedroom, full bathroom and second bedroom. Large multi-level chestnut barn and a 10 x 12 shed. Not responsible for misinformation or typographical errors. Prices are subject to change without notice. Copyright © Metes and Bounds Real Estate. All rights reserved.